Gear review | what to bring to a destination wedding? Dennis and I are so excited to be filming our first destination wedding on August 2 in the Mayan Riviera in Mexico. And while we generally fall in the minimalist camp when it comes to gear, we've spent months considering what to bring on the trip—and what's not going to make the cut. I fully expect to follow this post with another in about 3 weeks explaining the mistakes that we made in the course of making this decision. 1 - MacBook Pro. We'll be editing quite a bit in Mexico, and we still have a business to run. It's coming. 2 - Mavic Air. This couple is basically the reason we have a drone at all. They wanted one for their engagement film, which we shot last May, so it is a must-have for their wedding. 3 - Panasonic GH5 x 2 with Metabones speedboosters. These are our main cameras. We always have two, if not three angles on a ceremony, and we're not cutting back here. 4 - Panasonic GX85. Our back-up and third angle. 5 - Canon 80D. This was our first camera, then our back-up camera, and now we just use it to take photos for fun. I'd like to study photography more in-depth one day. 6 - Sigma Art 50-100mm. We love this lens for ceremony and speeches, so we get awesome footage while staying out of the way. 7 - Sigma Art 18-35mm. This lens is so versatile. We love using it for video and photos, so it comes. 8 - Canon 50mm. 1.2L I could shoot an entire wedding with this lens. And believe me, I've tried. It's a compact powerhouse of a lens. 9 - Voigtlanders, 17.5mm and 42.5mm. These are quickly becoming two of our favourites. The colour is beautiful, and the focus ring is buttery smooth. We like introducing a bit of analog into our work, and will likely invest in more of these in the future. 10 - Laowa 7.5mm - Dennis couldn't resist picking up this itty-bitty lens one day and it's been useful for those wide establishing shots. We'll be putting it to work on the beach. 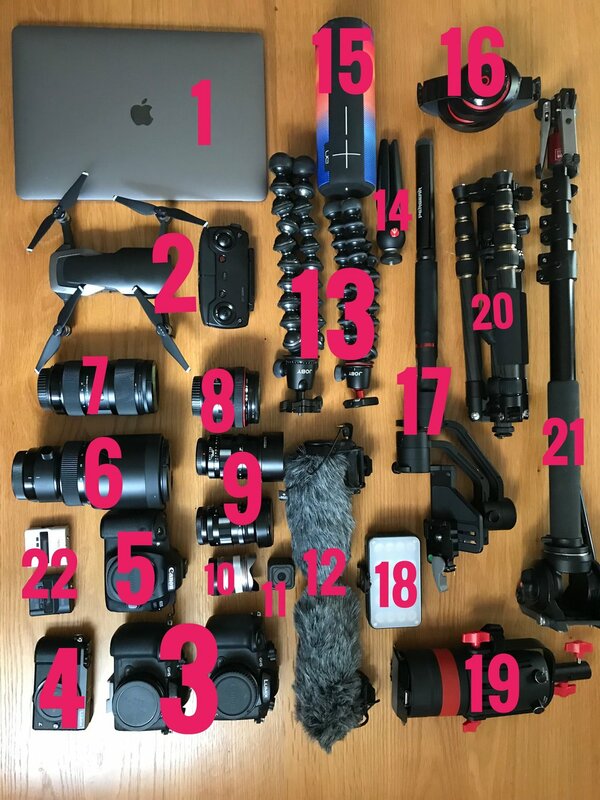 11 - GoPro Hero (and not shown, GoPro Hero 5&6). We'll be visiting a waterpark with our couple and their guests for the bachelor/bachelorette parties, so we'll bring these along to get some action shots. 12 - Rode Shotgun Mic Pro x 2 (plus brand new dead cats). Because good audio happens when you don't expect it. Be prepared! 13 - Gorillapods x 2. These have been so useful in small venues where there isn't enough space for a tripod or a light stand. Attach the GX85 or an LED panel to the Gorillapod and wrap it around a post or beam—problem solved! Since we're not bringing all our support gear, we'll make do with these little helpers. 14 - Manfrotto tripod. Same as above. 15 - Bluetooth speaker. Have music, will travel. 16 - Beats wireless headphones. For editing on the go. 17 - Moza gimbal. I want some epic beach running shots! 18 and 19 - LED panel and spotlight. Because good lighting makes a good film. 20 - Small folding tripod. We bought this a few months ago with this trip in mind, and it's a perfect partner for the GX85. 21 - Manfrotto monopod. I expect this will only be used on the wedding day for bride prep and the ceremony. Still necessary. 22- Tascam DR10L, white and black. One for the groom, one for the bride. We mic'd up the bride for the first time last weekend and we'll never go back! Light stands. They aren't heavy, but they're very long, and there's no way we'll fit them in the Pelican case. We do have two compact light stands that we would be taking along with us. Super compact, and super light. Multiple tripods. We can make-do without them, so they're out. Recorders (Zoom H4, H1s). We have our Tascams, which are working great!